If you are interested in a field trip to the career center on February 4th, please stop in Guidance TODAY for a permission slip. They need to be turned in on Monday morning. Attention Key Club Officers: The Board of Directors will meet on Monday at 8:15 a.m. The guidance office has received two general scholarships, the Niccum and the John A. & Dorothy H. Geyer. Also, the Phillip S. Preston basketball scholarship is now available. Stop by for more information! Seniors: IUSB will be here on Tuesday, February 9th for an onsite admissions visit. Have your application fee waived, see if you qualify for a $500 scholarship and receive an admissions decision on the spot! Sign up in guidance now, as slots go fast! If you are interested in a dishwasher position please contact Colette Myers or Shana Troyer in person at Dandino’s. Senior golfers: The guidance office has received the “Sunkin Ditch” scholarship. Please stop by for an application. The North Central Co-op Scholarship is now available in the guidance office for seniors pursuing a career in agriculture. Pick up an application to view the outline of requirements. The guidance office has received the Carol Rhinehart Memorial Medical scholarship. If you are entering the nursing and medical fields, be sure to pick up an application. Attention Seniors: Are you looking to go into the health care industry? Stop in the guidance office and pick up the Goshen Hospital Auxiliary Scholarship. The Goshen Public Library isn’t just for books! Nerd’s Night Out meets TONIGHT from 6:00-8:00 p.m., with a Fandom Freak Out party. All materials and snacks are provided for all of our monthly clubs! To sign up, or for more information about our programs, stop by the library or check out our website, Facebook or Twitter. IHSAA Student-Athlete Tip of the Week: How do you view your participation in sports and extra-curricular activities? Is it a right or is it a privilege? Anytime you are part of a school team, your participation is a privilege you have earned. There are rules and guidelines that you must follow or what you have earned can be taken away. There are consequences for bad actions and bad decisions. In light of two high school girls basketball seasons being cancelled (for girls and fans losing their composure and fighting during the contest), let it be a lesson to all. Sports participation is a privilege and this privilege can be and should be taken away in extreme cases where teams and fans lose focus on the number one priority of any high school sporting event, sportsmanship! Student Faculty Senate will meet on Thursday in the media center at 7:45 a.m. All club/activity sponsors are expected to attend or have a representative present. All club members are invited to attend and expected to have a student representative attend once/semester. Thank you for getting involved GHS! Tomorrow, the Goshen Bands will be hosting a Winter Guard Invitational here at GHS. Everyone is invited to attend. Tickets are $6. The show starts at 11:00 a.m. and lasts until 5:00 p.m. There are 36 groups performing, including three Goshen guards. The Goshen JV Winter Guard will perform at 12:06 p.m., the Goshen Cadet Guard at 2:08 p.m. and the Goshen Varsity Winter Guard will perform at 3:00 p.m. Come see a fabulous show this Saturday and support our GHS Guard and Band programs. See you there! The guidance office has received the 3 C’s Scholarship, which is a general scholarship that requires a history in athletics, as well as the Laura Kindig scholarship for students going into a nursing/medical profession. Please stop in for more information. All sophomore student-athletes are strongly encouraged to attend the Be the Best Leadership Program on February 9th during 2nd period and SRT in the auditorium. This program was rescheduled from January due to NWEA testing and promises to be much more fun than NWEA and hopefully more educational! Please sign up by next Wednesday, February 3rd in the GHS athletic office if you are considering attending. You can also see Mr. Kissinger during his lunch duty this Friday to sign up……or he will likely see you. You will need to be there for the entire time, so check out your SRT schedule. This program will focus on small group discussion and skit creation centered around “integrity” and “bullying/hazing prevention”. The boys freshman basketball team defeated New Prairie 40-23. Goshen was led in scoring by Joseph Good and Porter Revoir with 11 points each. The girls basketball C team won their last home game of the season against New Prairie 40-16. Leading scorers for the Lady RedHawks were Evelyn Santos with four points, Jazmin Vargas with five points, Kasey Rodriguez with six points, Zyanya Ponce with eight points and Madison Rittenhouse with an astounding 17 points. The girls varsity basketball team will play at Elkhart Memorial at 6:15 p.m. The boys varsity basketball team will play at Elkhart Memorial at 7:45 p.m. The girls freshman basketball team will play at Northwood in the NLC tourney at 9:00 a.m. The boys varsity wrestling team will compete at Elkhart Memorial in sectionals at 9:00 a.m. The boys varsity swim/dive team will compete at Northridge in NLC diving prelims at 9:00 a.m. The girls JV basketball team will compete at Elkhart Memorial at 10:00 a.m. The boys JV basketball team will compete at Elkhart Memorial at 11:30 a.m. The boys varsity swim/dive team will compete at Northridge in NLC swimming/diving finals at 1:00 p.m.
Super Mileage Club will meet on the following dates: February 9th and 23rd & March 8th and 22nd. Times are 7-8:15 a.m., and/or 3:45-5:30 p.m. The Goshen Public Library isn’t just for books! Nerd’s Night Out meets tomorrow from 6:00-8:00 p.m., with a Fandom Freak Out party. All materials and snacks are provided for all of our monthly clubs! To sign up, or for more information about our programs, stop by the library or check out our website, Facebook or Twitter. On Saturday, the Goshen Bands will be hosting a Winter Guard Invitational here at GHS. Everyone is invited to attend. Tickets are $6. The show starts at 11:00 a.m. and lasts until 5:00 p.m. There are 36 groups performing, including three Goshen guards. The Goshen JV Winter Guard will perform at 12:06 p.m., the Goshen Cadet Guard at 2:08 p.m. and the Goshen Varsity Winter Guard will perform at 3:00 p.m. Come see a fabulous show this Saturday and support our GHS Guard and Band programs. See you there! Student Council will meet TODAY during the 2nd session of SRT in Whiteman gym. The boys varsity swim/dive team will compete at Northridge in NLC prelims at 5:30 p.m. The boys and girls freshman basketball teams will host New Prairie at 6:30 p.m. The Goshen Public Library isn’t just for books! They also offer several FREE activities for young adults monthly (grades 6-12). The first Writing Club will meet TODAY from 4:00-6:00 p.m. Nerd’s Night Out meets on Friday from 6:00-8:00 p.m., with a Fandom Freak Out party. All materials and snacks are provided for all of our monthly clubs! To sign up, or for more information about our programs, stop by the library or check out our website, Facebook or Twitter. The guidance office has received the 3 C’s Scholarship, which is a general scholarship that requires a history in athletics. Please stop in for more information. Student Council will meet tomorrow during the 2nd session of SRT in Whiteman gym. There will be an IB open house for 9th and 10th grade parents and students TONIGHT at 6:30 p.m. in the media center. The Goshen Public Library isn’t just for books! They also offer several FREE activities for young adults monthly (grades 6-12). The first Writing Club will meet tomorrow from 4:00-6:00 p.m. Nerd’s Night Out meets on Friday from 6:00-8:00 p.m., with a Fandom Freak Out party. All materials and snacks are provided for all of our monthly clubs! To sign up, or for more information about our programs, stop by the library or check out our website, Facebook or Twitter. The boys track callout meeting will take place TODAY during the 2nd session of SRT in the main gym. Those interested should attend or see Coach Clark in room 1100 if you have any questions. There is a MANDATORY meeting for all girls track & field athletes TODAY during the 2nd session of SRT in Whiteman Gym. If you cannot be there, please contact Coach Smeltzer. There will be a final callout meeting for all girls playing tennis this spring TODAY during the 2nd session of SRT in Whiteman Gym. Please make every effort to be there! Student Council will meet on Thursday during the 2nd session of SRT in Whiteman gym. The C team Lady RedHawks battled against the Blazers, but fell short in the end 25-34. Leading scorers for Goshen were Madison Rittenhouse and Jazmin Vargas each with four points and Zyanya Ponce with nine points. The boys freshman basketball team defeated Elkhart Central 28-21. Goshen was led in scoring by Ben Bontrager-Singer and Eric Newell with nine points each. Attention Key Club Officers: The Board of Directors will meet on February 1st at 8:15 a.m. There will be an IB open house for 9th and 10th grade parents and students tomorrow at 6:30 p.m. in the media center. Attention Seniors: GHS will be hosting a financial aid meeting in the auditorium on TONIGHT at 7:00 p.m. The Goshen Public Library isn’t just for books! They also offer several FREE activities for young adults monthly (grades 6-12). Regular January programming concludes this month with The Crafty Bandits Arts & Crafts Club TONIGHT from 4:30-6:30 p.m. We will be making mittens out of old sweaters. The first Writing Club will meet Wednesday, from 4:00-6:00 p.m. Finally, Nerd’s Night Out meets on Friday from 6:00-8:00 p.m., with a Fandom Freak Out party. All materials and snacks are provided for all of our monthly clubs! To sign up, or for more information about our programs, stop by the library or check out our website, Facebook or Twitter. The boys track call out meeting will take place tomorrow during the 2nd session of SRT in the main gym. Those interested should attend or see Coach Clark in room 1100 if you have any questions. There is a MANDATORY meeting for all girls track & field athletes tomorrow during the 2nd session of SRT in Whiteman Gym. If you cannot be there, please contact Coach Smeltzer. There will be a final call out meeting for all girls playing tennis this spring tomorrow during the 2nd session of SRT in Whiteman Gym. Please make every effort to be there! The JV boys basketball team lost to Northwood on Friday night, 38-29. Michael Pinarski led the RedHawks with nine points while Brockton Yoder added seven. The varsity boys basketball team lost to Northwood on Friday night, 69-55. Senior Cam Kline led the RedHawks with a career high 17 points and junior Mitchell Walters added 11. The JV Lady RedHawks outscored the Jimmies 28-10 in the second half to win Friday night. The RedHawks shot 21-33 (64%) from the free throw line. Freshman Josie Walters led the team with nine points, four steals and five rebounds. Freshman Maggie Gallagher also had nine points to go with three steals and six rebounds. The varsity Lady RedHawkswere able to defeat Jimtown Friday night, 40-37. The RedHawks pulled to a lead in the first quarter before falling behind early in the second quarter. The RedHawks pulled together and took the lead with about three minutes left in the game. The RedHawks were led by senior Olivia Love with ten points and ten rebounds. Senior Kyrie Potter contributed 11 points to the victory. Junior Ashton Ellis had five assists and seven points. Senior Tahya Bruce also added seven rebounds. The JV Lady RedHawks fell to Northwood at the Pit, 49-27. The RedHawks were led in scoring by sophomores Breanna Boocher with eight and Megan Harmelink with seven. Freshman Josie Walters had six steals on the loss. The varsity Lady RedHawks battled for four quarters, but that wasn’t enough to put the Panthers away. The RedHawks needed overtime to finish the job, beating Northwood at their home court 55-51. The RedHawks were led by senior Olivia Love with 16 points and 16 rebounds. Fellow seniors Kyrie Potter scored 13 points and Tahya Bruce 15 points. The boys freshman basketball team will play at Elkhart Central at 6:00 p.m. The girls freshman basketball team will play at Elkhart Central at 6:00 p.m. Honoring the Tradition of the GHS Mascot: On February 20th, prior to the home GHS Boys’ Basketball game vs. LaPorte, Goshen Community Schools will host an open house to honor our proud tradition as the Goshen Redskins. The open house will be held from 4:30 – 6 PM in the GHS cafeteria. The open house will have memorabilia from our many years as the Goshen Redskins, the unveiling of a design for a commemorative display case in the GHS athletic area, the unveiling of a commemorative plaque, and the induction of “the Chief” into the GHS athletic wall of fame. The RedZone will be closed today. Attention Key Club Officers: The Board of Directors will not meet on Monday morning. Please plan to meet on February 1st at 8:15 a.m. If you are wondering why Mrs. Whittaker is walking the halls with a selfie stick, please follow Good of Goshen on Instagram and you’ll see what she’s up to. Attention Seniors: GHS will be hosting a financial aid meeting in the auditorium on Monday at 7:00 p.m. REMINDER: The Snowball dance will be held tomorrow from 8:30-10:30 p.m. in Whiteman Gym. Tickets will be sold this week in the commons during lunch, and also at the door. The cost is $6, or $5 with an activity ID. The guidance office has just received the Elnora Stickley Music Scholarship. The deadline for submission is TODAY. Stop in and get an application ASAP. Senior golfers: The guidance office has just received the “Sunkin Ditch” scholarship. Please stop by for an application. Registration forms are now available for soccer intramurals! Stop by the athletic office to pick up a team or individual sign-up sheet. The cost is $8 and forms are due by TODAY to the athletic office. If you played volleyball intramurals, there is no cost (unless you want a new shirt, then the cost is $5.00). See Mrs. West or email kwest@goshenschools.org for more information or questions. The guidance office has just received the Carol Rhinehart Memorial Medical scholarship. If you are entering the nursing and medical fields, be sure to pick up an application. The Goshen Public Library isn’t just for books! They also offer several FREE activities for young adults monthly (grades 6-12). Regular January programming concludes this month with The Crafty Bandits Arts & Crafts Club on Monday, January 25th from 4:30-6:30 p.m. We will be making mittens out of old sweaters. The first Writing Club will meet Wednesday, January 27th from 4:00-6:00 p.m. Finally, Nerd’s Night Out meets on Friday, January 29th from 6:00-8:00 p.m., with a Fandom Freak Out party. All materials and snacks are provided for all of our monthly clubs! To sign up, or for more information about our programs, stop by the library or check out our website, Facebook or Twitter. The boys track callout meeting will take place on Tuesday during the 2nd session of SRT in the main gym. Those interested should attend or see Coach Clark in room 1100 if you have any questions. There is a MANDATORY meeting for all girls track & field athletes on Tuesday during the 2nd session of SRT in Whiteman Gym. If you cannot be there, please contact Coach Smeltzer. There will be a final callout meeting for all girls playing tennis this spring on Tuesday during the 2nd session of SRT in Whiteman Gym. Please make every effort to be there! The boys freshman basketball team lost to Northwood 40-29. They were led in scoring by Porter Revoir with 12 points. Goshen C team girls basketball lost to Northwood 18-35. The leading scorer for the Lady RedHawks was Zyanya Ponce with six points. The girls JV and varsity basketball teams will play at Jimtown. JV starts at 6:00 p.m., followed by varsity at 7:30 p.m. The boys JV and varsity basketball teams will host Northwood. JV starts at 6:15 p.m., followed by varsity at 7:30 p.m. The boys varsity wrestling team will compete at Elkhart Memorial in the NLC Tourney at 9:00 a.m. The boys JV wrestling team will compete in the Plymouth Invitational at 9:00 a.m. The boys and girls varsity swim/dive team will compete in the Mishawaka Diving Invitational at 10:00 a.m. The girls JV and varsity basketball teams will play at Northwood. JV starts at 6:15 p.m., followed by varsity at 7:30 p.m.
Each year for the past 5 years, the GCS music faculty has worked together to present a “Benefit Recital” for the public and our students. The funds generated from this recital go directly to student scholarships. This year the recital will be on Sunday afternoon, January 31st at 2:00 p.m. in the GHS Auditorium. We cordially invite you to attend, and enjoy some incredible music presented by the GCS Music Faculty. You will hear string selections, an incredible jazz combo, instrumental and vocal solos; even a barbershop quartet! Tickets will be sold at the door and are $4 for students and $6 for adults. The Music Faculty includes: Deanna Board, Zac Coudret, Tom Cox, Caroline Garber, Josh Hren, Josh Kaufman, Max Mault, Sean Patrick, Jason Pfeifer, Rocco Duranti, Stephen Snyder, Monica Stutzman, Marcia Yost, and GHS Private Teachers. Thank you to all of you that visited Honey’s for their give back day supporting GHS! The RedZone will be closed for the next two days. REMINDER: The Snowball dance will be held on Saturday from 8:30-10:30 p.m. in Whiteman Gym. Tickets will be sold this week in the commons during lunch. The cost is $6, or $5 with an activity ID. The guidance office has just received the Elnora Stickley Music Scholarship. The deadline for submission is tomorrow. Stop in and get an application ASAP. Registration forms are now available for soccer intramurals! Stop by the athletic office to pick up a team or individual sign-up sheet. The cost is $8 and forms are due by tomorrow to the athletic office. If you played volleyball intramurals, there is no cost (unless you want a new shirt, then the cost is $5.00). See Mrs. West or email kwest@goshenschools.org for more information or questions. Are you interested in finding out more about the opportunities at the Elkhart Area Career Center? They will be here TODAY to explain the programs they have and answer your questions during the 1st session of SRT in the auditorium. Not sure what programs they have? Check out the Bulletin of courses on line for a listing of the classes. Many news classes have been added, including Veterinary Tech and Crime Scene Investigation. All sophomores and juniors are welcome to attend. The boys JV wrestling team will compete in the Westview Invitational at 5:00 p.m. The girls freshman basketball team plays at Northwood at 6:00 p.m. The boys freshman basketball team plays at Northwood at 7:30 p.m.
TODAY is Honey’s Give Back Day! 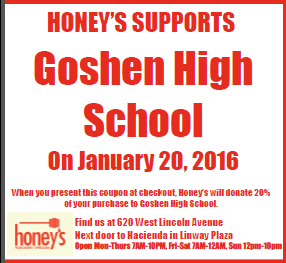 Please visit Honey’s and enjoy something sweet anytime that day, and 20% of what you spend will be donated to GHS. Coupons will be available in the main office and guidance. Attention Seniors: GHS will be hosting a financial aid meeting in the auditorium on January 25th at 7:00 p.m. The guidance office has just received the Elnora Stickley Music Scholarship. The deadline for submission is Friday. Stop in and get an application ASAP. Registration forms are now available for soccer intramurals! Stop by the athletic office to pick up a team or individual sign-up sheet. The cost is $8 and forms are due by Friday to the athletic office. If you played volleyball intramurals, there is no cost (unless you want a new shirt, then the cost is $5.00). See Mrs. West or email kwest@goshenschools.org for more information or questions. Are you interested in finding out more about the opportunities at the Elkhart Area Career Center? They will be here tomorrow to explain the programs they have and answer your questions during the 1st session of SRT in the auditorium. Not sure what programs they have? Check out the Bulletin of courses on line for a listing of the classes. Many news classes have been added, including Veterinary Tech and Crime Scene Investigation. All sophomores and juniors are welcome to attend. The boys track call out meeting will take place on Tuesday, January 26th during the 2nd session of SRT in the main gym. Those interested should attend or see Coach Clark in room 1100 if you have any questions. There is a MANDATORY meeting for all girls track & field athletes on Tuesday, January 26th during the 2nd session of SRT in Whiteman Gym. If you cannot be there, please contact Coach Smeltzer. There will be a final call out meeting for all girls playing tennis this spring on Tuesday, January 26th during the 2nd session of SRT in Whiteman Gym. Please make every effort to be there! The Goshen boys swim/dive team defeated New Prairie 122-64 and East Noble 126-60. Standout performances were 200 Medley Relay 1st place (Ben Sommers, Logan Hoogenboom, Alan Rivera, Ian Shreiner Barger) setting a new pool record, 4th place (Bailey Eden, Cade Fisher, Samuel Miller, Rafael Hernandez-Walton), 5th place (Bryan Reyes, Zefram Fransen, Sam Metcalfe, Hudson Kay), 200 Freestyle 1st place (Alex Ramos) setting a new pool record, 2nd place (Zefram Fransen), 8th place (Will Gaby), 200 Individual Medley 3rd place (Logan Hoogenboom) 4th place (Cade Fisher), 5th place (Ian Shreiner Barger), 50 Freestyle 2nd place (Ben Sommers), 4th place (Brenn McKee), 5th place (Hudson Kay), Diving 1st place (Hudson Kay) setting a new pool record, 5th place (Joey Wade), 7th place (Brenn McKee), 100 Butterfly 1st place (Ian Shreiner Barger) setting a new pool record, 2nd place (Alan Rivera), 100 Freestyle 2nd place (Sam Miller), 4th place (Cade Fisher), 5th place (Bryan Reyes), 500 Freestyle 1st place (Alex Ramos) setting a new pool record, 3rd place (Sam Metcalfe), 4th place (Ben Sommers), 200 Freestyle Relay 1st place (Rafael Hernandez-Walton, Brenn McKee, Alex Ramos, Ben Sommers) setting a new pool record, 3rd place (Alan Rivera, Zefram Fransen, Sam Miller, Jackson Miller), 6th place (Sam Metcalfe, Will Gaby, Bryan Reyes, Hudson Kay), 100 Back Stroke 1st place (Jackson Miller) setting a new pool record, 4th place (Bailey Eden), 8th place (Bryan Reyes), 100 Breast Stroke 1st place (Logan Hoogenboom) setting a new pool record, 4th place (Jackson Miller), 5th place (Bailey Eden), 400 Freestyle Relay 1st place (Alex Ramos, Logan Hoogenboom, Jackson Miller, Ian Shreiner Barger) setting a new pool record, 3rd place (Cade Fisher, Sam Miller, Alan Rivera, Bailey Eden), 5th place (Brenn McKee, Sam Metcalfe, Rafael Hernandez-Walton, Zefram Fransen). In total, Goshen Boys set nine pool record last night! Goshen had ten career best times! The Goshen girls swim/dive team beat East Noble 100-84 and lost to New Prairie 103-82. Outstanding performances go to: 200 Medley Relay 2nd place (Jenea Born, Shannon Smoot, Emma Hussey, Ellie Zehr), 5th place (Ellie Kercher, Monse Ramos, Abby Hetler, Kimberly Grounds), 7th place (Montce Martinez, Molly Metcalfe, Sam Speicher, Kim Diaz), 200 Freestyle 1st place (Anna Paetkau) setting a new pool record, 6th place (Olivia Thomas), 9th place (Annika Smith), 200 Individual Medley 3rd place (Jenea Born), 6th place (Shannon Smoot), 8th place (Emma Russell), 50 Freestyle 5th place (Kimberly Grounds), 7th place (Molly Metcalfe), Diving 4th place (Karla Hernandez-Walton), 5th place (Elkah DeVoe), 100 Butterfly 1st place (Abby Hetler) setting a new pool record, 7th place (Tiffany Reith), 9th place (Ellie Kercher), 100 Freestyle (Emma Hussey) setting a new pool record, 6th place (Kimberly Grounds), 7th place (Aurora Flores), 500 Freestyle 4th place (Carolina Olivo), 5th place (Syreeta Moore), 6th place (Emma Russell), 200 Freestyle Relay 1st place (Anna Paetkau, Ellie Zehr, Abby Hetler, Jenea Born) setting a new pool record, 5th place (Tiffany Reith, Shannon Smoot, Kimberly Grounds, Aurora Flores), 7th place (Syreeta Moore, Kim Diaz, Cora Campanello, Emma Russell), 100 Back Stroke 1st place (Emma Hussey) setting a new pool record, 7th place (Montce Martinez), 9th place (Cora Campanello), 100 Breast Stroke 4th place (Molly Metcalfe), 5th place (Monse Ramos), 6th place (Tiffany Reith), 400 Freestyle Relay 1st place (Anna Paetkau, Jenea Born, Abby Hetler, Emma Hussey) setting a new pool record, 4th place (Ellie Zehr, Shannon Smoot, Tiffany Reith, Molly Metcalfe), 5th place (Carolina Olivo, Olivia Thomas, Aurora Flores, Annika Smith) In all, Goshen girls set six pool records! Goshen also had 14 career best times! The boys freshman basketball team lost to East Noble 25-20. They were led in scoring by Austin Cain and Eric Newell with six points each. The JV boys basketball team defeated Jimtown 51-28. Sophomore Brockton Yoder led the RedHawks with 15 points and junior Michael Pinarski added 11. The varsity boys basketball team lost to Jimtown 58-55. Brady Becthel led the RedHawks with 21 points and Eliot Nafziger added 13. James Paetkau contributed 11 points in the loss. The JV Lady RedHawks lost a hard fought game to Mishawaka in their final home game of the season with a score of 24-21. Junior Jordan Nemeth led the RedHawks in scoring with eight points and four steals. Freshman Josie Walters led the team in rebounding with eight while fellow freshman Maggie Gallagher had six. The varsity Lady RedHawks came from behind to beat Mishawaka 50-36. The RedHawks were down 20-19 at halftime before coming out strong to finish the game. Senior Olivia Love led the team with ten points and ten rebounds. Seniors Kyrie Potter and Tahya Bruce had 16 and eight points, respectively. Junior Ashton Ellis added eight points and junior Aylissa Trosper contributed six assists. Tomorrow is Honey’s Give Back Day! Please visit Honey’s and enjoy something sweet anytime that day, and 20% of what you spend will be donated to GHS. Coupons will be available in the main office and guidance. Are you interested in finding out more about the opportunities at the Elkhart Area Career Center? They will be here on Thursday to explain the programs they have and answer your questions during the 1st session of SRT in the auditorium. Not sure what programs they have? Check out the Bulletin of courses on line for a listing of the classes. Many news classes have been added, including Veterinary Tech and Crime Scene Investigation. All sophomores and juniors are welcome to attend. If you are interested in helping to plan prom please join us during the 2nd session of SRT TODAY. We will meet right outside the main office by the steps. The boys track callout meeting will take place on Tuesday, January 26th during the 2nd session of SRT in the main gym. Those interested should attend or see Coach Clark in room 1100 if you have any questions. There will be a final callout meeting for all girls playing tennis this spring on Tuesday, January 26th during the 2nd session of SRT in Whiteman Gym. Please make every effort to be there! The JV boys basketball team won at Warsaw on Friday night by a score of 32-28. Michael Pinarski led the RedHawks with 13 points and Lucas Bontreger added six. The varsity boys basketball team lost at Warsaw on Friday night by a score of 55-41. Brady Bechtel led the RedHawks with 12 points while Colton Potter added six. Goshen finished an impressive 6th place at the NLC Championships. At prelims on Thursday night, Goshen swam 24 individual events, recording 13 career best times, and advancing 16 events into finals. At the conference finals meet, Goshen posted impressive finishes in the 200 Medley Relay (Emma Hussey, Makala Saeger, Jenea Born, Ellie Zehr) 4th place, 200 Freestyle Emma Hussey 5th and Abby Hetler 15th, 200 Individual Medley Makala Saeger 9th, Anna Paetkau 10th, and Molly Hetcalfe 15th, 50 Freestyle Karla Hernadez-Walton 16th, Diving Karla Hernandez-Walton 10th, 100 Butterfly Jenea Born 5th, Anna Paetkau 9th, Syreeta Moore 16th, 100 Freestyle Abby Hetler 10th, 500 Freestyle Emma Hussey 4th, Ellie Zehr 11th, 200 Freestyle Relay (Jenea Born, Ellie Zehr, Anna Paetkau, Abby Hetler) 5th, 100 Back Stroke Jenea Born 9th, Ellie Zehr 16th, 100 Breast Stroke Makala Saeger 6th, Monse Ramos 16th, 400 Freestyle Relay 6th (Abby Hetler, Makala Saeger, Anna Paetkau, Emma Hussey). At Finals Goshen had 12 career best times. In total Goshen had 25 career best times! The JV Lady RedHawks lost to conference foe Warsaw Saturday night, 37-24. Freshman Josie Walters led the team in scoring with 12 points, rebounds with seven, assists with two and steals with four. Junior Nyla Dean added eight points for the RedHawks. The varsity Lady RedHawks battled in a tough conference matchup Saturday night, losing to Warsaw 37-33. The RedHawks fell behind 13-6 at halftime in a defensive battle, then came out and took the lead at the end of the third quarter. They were not able to hang on to their lead however. The RedHawks were led in scoring by junior Aylissa Trosper with 15 points, nine of them from behind the three point line. Senior Olivia Love led the team in rebounds with seven. The boys freshman basketball team will play at East Noble at 6:00 p.m. The girls JV and varsity basketball teams will host Mishawaka. JV plays at 6:00 p.m., followed by varsity at 7:30 p.m. The boys/girls JV and varsity swim/dive teams will host East Noble, Westview and New Prairie at GMS starting at 6:00 p.m. The boys JV and varsity basketball teams will play at Jimtown. JV plays at 6:00 p.m., followed by varsity at 7:30 p.m.
On Monday, the lights in all of the GHS parking lot lamp posts will be replaced. We do not have school on Monday, but there will be athletic practices and music activities. Please do NOT park near a lamp post on Monday. Enjoy your long weekend! Wednesday is Honey’s Give Back Day! Please visit Honey’s and enjoy something sweet anytime that day, and 20% of what you spend will be donated to GHS. Coupons will be available in the main office and guidance. Reminder: If you have clay pieces in Mrs. Cooper’s room (1450) please pick them up as soon as possible. REMINDER: The Snowball dance will be held on January 23rd from 8:30-10:30 p.m. in Whiteman Gym. Tickets will be sold the week of the dance in the commons during lunch. The guidance office has just received the Elnora Stickley Music Scholarship. The deadline for submission is January 22nd. Stop in and get an application ASAP. Registration forms are now available for soccer intramurals! Stop by the athletic office to pick up a team or individual sign-up sheet. The cost is $8 and forms are due by Friday, January 22nd to the athletic office. If you played volleyball intramurals, there is no cost (unless you want a new shirt, then the cost is $5.00). See Mrs. West or email kwest@goshenschools.org for more information or questions. The Goshen Public Library doesn’t just lend books! They also offer FREE activities for young adults. Stop in on Thursdays after school from 4-6:00 p.m. to hang out, study, find an independent reading book, play a board game, color or just chillax at teen café! And, of course, we’ll also have hot chocolate and coffee. We have two NEW clubs starting this month. Manga Club meets first and third Wednesdays from 4-5:00 p.m. and Writing Club meets fourth Wednesdays from 4-6:00 p.m. in the teen area. Our regular monthly programming also begins again on Thursday, January 21st with our Pages & Popcorn Club from 5:30-8:00 p.m. We’ll talk about the book Me and Earl and the Dying Girl and watch the movie. You can still sign up to get a free copy of the book. The Crafty Bandits will meet up on Monday, January 25th from 4:30-6:30 p.m. where we’ll have snacks and learn some simple sewing by turning old sweaters into mittens. Finally, our regular programming will conclude this month with Nerd’s Night Out Fandom Freak Out Party. Bring your friends for tons of activities celebrating your favorite fandoms, plus pizza and prizes. To sign up or for more information about our programs, stop by the library or check out our GPL Teens webpage, Facebook or Twitter. Are you interested in finding out more about the opportunities at the Elkhart Area Career Center? They will be here on Thursday, January 21st to explain the programs they have and answer your questions during the 1st session of SRT in the auditorium. Not sure what programs they have? Check out the Bulletin of courses on line for a listing of the classes. Many news classes have been added, including Veterinary Tech and Crime Scene Investigation. All sophomores and juniors are welcome to attend. Students please use this year’s IDs only. This is a safety issue for us and we would appreciate your cooperation on this. Thank you! The varsity Lady RedHawks were able to overcome a slow start to beat Riley, 76-33. The RedHawks were trailing 18-15 at the end of the 1st quarter before leading 40-20 at halftime. 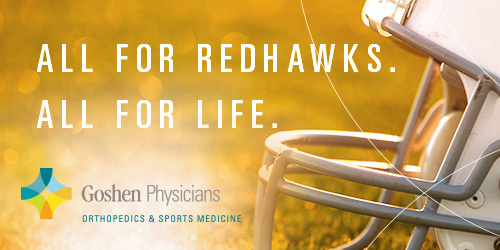 The RedHawks outscored the Wildcats 49-5 in the 2nd and 3rd quarters. They were led in scoring by Ashton Ellis, Aylissa Trosper and Olivia Love with 15 points each. Trosper and Ellis each had seven steals to go with their four assists each. Love led the team with ten rebounds on the night. The JV Lady RedHawks were able to jump out to a 35-9 lead at halftime. They held on to win 55-28. They were led in scoring by Josie Walters with ten points, Laura Sanchez Lopez with nine points, Kassandra Rodriquez with eight points and Breanna Boocher with seven points. Rodriquez also had three steals and six rebounds. Nyla Dean led the team in rebounds with eight. The girls C basketball team lost to Warsaw 12-39. The leading scorer for the Lady RedHawks was Lupita Salazar with six points. The boys wrestling team defeated Warsaw 48-29. Winning by pin for the RedHawks were Braxton Rodriguez, Ricky Flores, Hector Flores, Miguel Navarro, Julio Navarro and Derek Paz. The boys freshman basketball team lost to Warsaw 32-26. The RedHawks were led in scoring by Porter Revoir with seven points. The boys JV and varsity basketball teams will compete at Warsaw. JV plays at 6:15 p.m., followed by varsity at 7:30 p.m. The boys varsity wrestling team will host the Goshen Invite at 9:00 a.m. The girls varsity swim/dive team will compete in the NLC diving prelims at 9:00 a.m. at Concord. The girls varsity swim/dive NLC finals will be at 1:00 p.m. at Concord. The girls JV and varsity basketball teams will host Warsaw. JV plays at 6:15 p.m., followed by varsity at 7:45 p.m.
Wednesday, January 20th is Honey’s Give Back Day! Please visit Honey’s and enjoy something sweet anytime that day, and 20% of what you spend will be donated to GHS. Coupons will be available in the main office and guidance. Due to the girls game being postponed on Tuesday, the boys soccer will not be meeting this week for open play. They will meet next Thursday at the same time as scheduled before. Stay In Bounds Ambassadors will meet TODAY in the main gym during the 2nd session of SRT to plan for their January visit to 4th grade classes. The girls varsity swim/dive NLC prelims will be held at Concord at 5:30 p.m. The boys JV and varsity wrestling teams will compete at Warsaw at 6:45 p.m. The boys freshman basketball team will host Warsaw at 7:30 p.m. The girls freshman basketball team will host Warsaw at 6:30 p.m. The girls JV basketball team will host SB Riley at 6:00 p.m. The girls varsity basketball team will host SB Riley at 7:30 p.m. Attention Seniors: GHS will be hosting a financial aid meeting in the auditorium on January 25th @ 7:00 p.m. The next open play for boys soccer is tomorrow from 8:00-9:30 p.m. in the main gym. This is open to any student. In order to be able to play, you must have a physical on file in the athletic office. Stay In Bounds Ambassadors will meet tomorrow in the main gym during the 2nd session of SRT to plan for their January visit to 4th grade classes. The girls C basketball team won 33-18 against Angola in the first round of the Westview Tournament on Saturday. Leading scorers for the Lady RedHawks were Kasey Rodriguez and Zyanya Ponce with five points, Madison Rittenhouse with seven points and Courtney Sloop with 11 points. Goshen lost 20-47 on Saturday against Westview in the championship game of the Westview Tournament. Leading scorers for the Lady RedHawks were Courtney Sloop and Lupita Salazar with four points and Zyanya Ponce with seven points. The Goshen wrestling team defeated Wawasee 43-25. Winning by pin for the RedHawks were Fernando Flores, Ricky Flores and Jose Montanez. Congratulations to the following GHS students for winning in the scholastic art show. Their artwork was picked out of 5000 entries and will be on display for the month of February at the South Bend Museum of Art. It is truly an honor to be picked for this event! Their work will be judged again to see if they win other special awards. Volleyball workouts will begin TODAY after school from 4:00-6:00 p.m. These will be every Tuesday and Wednesday and players should meet in the weight room after changing. This is open to any off-season female athlete. See Coach West for more details. Jim Kessler, the Hall of Fame basketball coach from Grace College will be speaking at the Fellowship of Christian Athletes meeting tomorrow. Coach Kessler has been the head coach at Grace College for the last 38 years where he has won an amazing 722 games. The FCA meeting will take place in room 8030 and will begin at 7:35 a.m. There will be no boys soccer open play tonight. The next open play is on Thursday from 8:00-9:30 p.m. in the main gym. Boys soccer open play is open to any student. In order to be able to play, you must have a physical on file in the athletic office. Congratulations to the following students for winning in the scholastic art show. Their artwork was picked out of 5000 entries and will be on display for the month of February at the South Bend Museum of Art. It is truly an honor to be picked for this event. Their work will be judged again to see if they win other special awards. Please take a minute to congratulate them if you see them! Stay In Bounds Ambassadors will meet this Thursday in the main gym during the 2nd session of SRT to plan for their January visit to 4th grade classes. The boys freshman basketball team defeated West Noble 36-32. Goshen was led in scoring by Austin Cain and Joseph Good with eight points each. The girls JV and varsity basketball teams will host SB Riley. JV plays at 6:00 p.m., followed by varsity at 7:30 p.m. The boys JV and varsity wrestling teams will compete at Wawasee at 6:45 p.m.
Volleyball workouts will begin tomorrow after school from 4:00-6:00 p.m. These will be every Tuesday and Wednesday and players should meet in the weight room after changing. This is open to any off-season female athlete. See Coach West for more details. Any student interested in competing in this year’s National Shakespeare Competition needs to see Mr. Garvin ASAP. Competitors will recite a twenty line monologue from one of Master Shakespeare’s plays for a chance to compete at the state level. The state winner will receive an all-expense paid trip to New York for the National Competition where the winner will receive a scholarship to study theatre in London. Our local competition will be on Tuesday, January 19th at 3:45 p.m. Time is out of joint! O cursed spite! Now it’s your chance to set it right! Boys Sports Performance (football & track) workouts will begin TODAY. You must have a physical on file in order to participate. We will meet in the weight room on Mondays and Thursdays from 3:55-5:00 p.m., and meet at the warehouse on Tuesdays from 3:55-5:00 p.m. If you are planning on playing football next fall, you should attend. See Coach Park with any questions. Jim Kessler, the Hall of Fame basketball coach from Grace College will be speaking at the Fellowship of Christian Athletes meeting on Wednesday morning. Coach Kessler has been the head coach at Grace College for the last 38 years where he has won an amazing 722 games. The FCA meeting will take place in room 8030 and will begin at 7:35 a.m. The JV girls basketball team defeated the Lady Minutemen, 45-29. The Redhawks were led in scoring by Maggie Gallagher and Jordan Nemeth with ten and eleven points, respectively. Josie Walters contributed seven steals to the victory while Monse Rodriguez pulled down ten rebounds. The varsity Lady Redhawks were able to steadily increase their lead over Concord throughout the game, winning 49-23. The Redhawks were led by senior Olivia Love with a ten point, 13 rebound game. Ashton Ellis added 12 points. The varsity boys basketball team lost at Mishawaka Marian 46-41. Senior Cam Kline led the RedHawks with eleven points, while fellow senior Brady Bechtel and sophomore Clayton Litwiller each added ten in the loss. The JV boys basketball team lost at Mishawaka Marian 43-35. Michael Pinarski led the RedHawks with nine points, and Philip Wertz added eight. Goshen swam well against Wawasee, and posted 15 career best times. 1st place finishers were: 200 Medley Relay (Emma Hussey, Makala Saeger, Jenea Born, Anna Paetkau), 200 Freestyle (Emma Hussey), 100 Freestyle (Emma Hussey). Goshen swam well against Wawasee, and posted nine career best times on their way to a close finish. 1st place finishers were: 200 Medley Relay (Ben Sommers, Logan Hoogenboom, Alex Ramos, Ian Shreiner Barger), 50 Freestyle (Ian Shreiner Barger), Diving (Hudson Kay), 100 Butterfly (Alex Ramos). The Goshen RedHawks varsity boys basketball team won 48-30 at Concord. The Hawks used stifling defense in the first half to take a 14-point halftime lead and never looked back. Senior Brady Bechtel led Goshen with 15 points and senior CJ Detweiler added 11 points and 11 rebounds. The boys freshman basketball defeated South Bend Adams 41-39. Goshen was led in scoring by Ben Bontrager-Singer with nine points. The boys freshman basketball team lost to Northwood 32-29. Goshen was led in scoring by Ben Bontrager-Singer and Bryant Robinson with eight points each. The Goshen RedHawks JV boys basketball team lost 47-38 at Concord on Friday night. Sophomore Will Line led the Hawks with 13 points. The boys freshman basketball team will host West Noble at 6:30 p.m.
1st semester ceramics students please pick up your glazed pieces in room 1450 ASAP. Volleyball workouts will begin on Tuesday after school from 4:00-6:00 p.m. These will be every Tuesday and Wednesday and players should meet in the weight room after changing. This is open to any off-season female athlete. See Coach West for more details. The Sophomore Be the Best Leadership Workshop will be rescheduled from Jan. 12th due to mandatory testing for all sophomores. We apologize for the conflict. Information will be shared when a new date is determined. Students and staff will no longer be able to deposit money in the cafeteria at breakfast. Please see the bookkeeper to deposit your money. Mrs. Haney can accept cash, check or debit/credit cards. You can also deposit money or check your balance at myschoolbucks.com. After Spring Break, no money will be accepted in the cafeteria. You will need money on your account to make ANY purchases. Boys Sports Performance (football & track) workouts will begin on Monday. You must have a physical on file in order to participate. We will meet in the weight room on Mondays and Thursdays from 3:55-5:00 p.m., and meet at the warehouse on Tuesdays from 3:55-5:00 p.m. If you are planning on playing football next fall, you should attend. See Coach Park with any questions. The boys freshman basketball team defeated Concord 29-26. Goshen was led in scoring by Joseph Good and Bryant Robinson with seven points each. The boys wrestling team defeated Concord 69-9. Winning by pin for the RedHawks were: Ricky Flores, Hector Flores, Christian Horton, Noah Shively, Daniel Hidalgo, Julio Navarro, Erik Contreras and Jose Montanez. The Lady RedHawks C basketball team lost against Concord 25-34. Leading scorers were Evelyn Santos with six points and Jazmin Vargas with five points. The boys JV and varsity basketball teams will compete at Concord. JV starts at 6:15 p.m., followed by varsity at 7:30 p.m. The boys JV wrestling team will compete in the SB Riley Wildcat Invite at 9:00 a.m. The girls freshman basketball team will play in the Westview Tourney at 9:00 a.m. The boys freshman basketball team will compete in the 9th grade tourney at 9:00 a.m. The boys/girls JV and varsity swim/dive teams will compete at Wawasee at 9:30 a.m. The boys JV basketball team will play at Mishawaka Marian at 6:15 p.m. The girls JV basketball team will host Concord at 6:15 p.m. The boys varsity basketball team will play at Mishawaka Marian at 7:30 p.m. The girls varsity basketball team will host Concord at 7:30 p.m.
Volleyball workouts will begin on Tuesday, January 12th after school from 4:00-6:00 p.m. These will be every Tuesday and Wednesday and players should meet in the weight room after changing. This is open to any off-season female athlete. See Coach West for more details. Boys Sports Performance (football & track) workouts will begin on Monday, January 11th. You must have a physical on file in order to participate. We will meet in the weight room on Mondays and Thursdays from 3:55-5:00 p.m., and meet at the warehouse on Tuesdays from 3:55-5:00 p.m. If you are planning on playing football next fall, you should attend. See Coach Park with any questions. Key Club will meet TODAY in the cafeteria during the 2nd session of SRT. Members who ordered a t-shirt should bring $9 cash or check to the meeting. The GHS Debate and Speech Club will meet TODAY in Mrs. Mehl’s room (2350) during the 2nd session of SRT. The Student Athletic Council will meet TODAY during the 2nd session of SRT in the main gym. Any junior or senior who is not a member of Athletic Council but is interested in being a “Student Partner” for the GHS Unified Track & Field team this spring should also attend this meeting. We will have important updates on the Unified Track & Field team, will arrange fan appreciation nights for winter sports, have a leadership activity, discuss current events in high School athletics and eat left over Christmas snacks! The boys and girls JV and varsity swim/dive teams will host Mishawaka and Westview at 5:00 p.m. The boys JV and varsity wrestling teams will compete at Concord at 6:45 p.m. The boys freshman basketball team will host Concord at 7:00 p.m. The girls freshman basketball team will host Concord at 7:00 p.m.